Casie Genetti will introduce The Gene Discovery Core at The Manton Center for Orphan Disease Research, established to provide the infrastructure and interdisciplinary collaborations needed for gene discovery in patients with complex undiagnosed diseases. This presentation will review their process for gene discovery, including case examples featuring downstream functional analysis for candidate genes. Jessica Douglas will discuss strategies for communicating novel gene diagnoses to patients and their families and how clinicians can best assist families in navigating a diagnosis of a previously undescribed condition. Casie Genetti is a genetic counselor and project manager at Boston Children’s Hospital specializing in rare disease research. She received her Master’s degree in Genetic Counseling from Boston University in May 2015 and began working with The Manton Center for Orphan Disease Research and The Beggs Congenital Myopathy Research Program at Boston Children’s Hospital in 2015. Jessica Douglas has been a clinical pediatric genetic counselor for the Feingold Center at Boston Children’s Hospital for the past 10 years. Her practice is centered around diagnostic management and coordinated care for complex pediatric patients and their families. Her other clinical focuses include pre-conceptual genetic counseling and teratogen counseling via the Mother-To-Baby service. She earned her MS in Genetic Counseling from Brandeis and has previously worked as a genetic counselor at U. Mass. Memorial in Worcester and at MGH. After obtaining her B.S. in biology with a minor in chemistry from Boston College in 2007, Meghan attended Boston University School of Medicine for her graduate studies in Genetic Counseling. Her studies piqued her interest in the impact of innovative technologies on diagnosing and connecting families with rare genetic disorders. 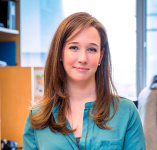 Meghan worked for seven years at Boston Children’s Hospital developing the institutional infrastructure for gene discovery, enhancing research collaborations, and evaluating the utility of genomic sequencing in newborns. In 2016, Meghan joined Ambry as a reporting genetic counselor on the clinical genomics team. She maintains her research connections to the Boston community by serving as a voting member of the Massachusetts General Hospital IRB and as a course coordinator for research seminar series at Boston University.